“I’m gonna be honest with you, Rod. 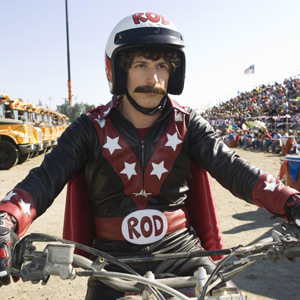 You look like a giant eagle with fire all around you, and you’ve got a mountain for a face” – Dave, Hot Rod. Hot Rod (2007), directed by Akiva Schaffer and written by Pam Brady is a film starring the Saturday Night Live group, ‘The Lonely Island’. It follows an eccentric man named Rod Kimble (Andy Samberg) who lives with his mother (Sissy Spacek), stepfather Frank (Ian McShane) and stepbrother Kevin (Jorma Taccone). Rod dreams of one day becoming an amazing stuntman like his father, but he also spends his time attempting to gain some respect and recognition from his stepfather. Tragedy strikes when Frank becomes ill due to a heart issue, so Rod undertakes an all-consuming quest to save his life by raising money for the surgery. He sets out to do the seemingly impossible – to break a world record and ‘clear’ fifteen buses on his moped. As of 2011, the film had a rating of 40% on the review site Rotten Tomatoes, which was based on just over 100 reviews. Over 60 considered the movie ‘rotten’, and around 40 considered it ‘fresh’. Although the film isn’t exactly mainstream, in the recent years it has become a cult classic due to the rising popularity of The Lonely Island group. This cutely anomalous film has many cameo appearances from other Saturday Night Live members such as Bill Hader, Danny McBride and Will Arnett. The soundtrack is also notable as it consists of a range of varying pieces of music including Mozart, Moving Pictures Cutting Crew and Europe, who each contributed to eight different tracks, which added to the atmosphere of the film. Hot Rod only runs for 88 minutes, and the time is passed quite quickly due to the comedy – some of you may have sore ribs from laughter by the end of the film. Even though it bombed at the box office earning only $13,938,332, as the film progresses, viewers will certainly get their fair share of entertainment out of it. This entry was posted in Film and tagged comedy, film, hot rod, Review. Bookmark the permalink.